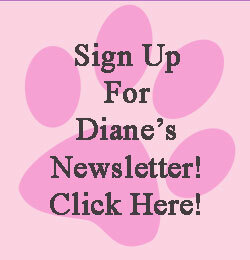 HomePet TherapiesAccupressure for AnimalsSEIZURES: CANINE ACUPRESSURE + ICE! When your dog has a seizure it’s scary. You desperately want to help him while he looks so helpless and at the mercy of his nervous system going haywire. There are things you can do. First thing you need to do is make sure the dog is in a safe location. Clear any obstacles on which he can be hurt. If there are stairs or any other dangers, block them off or try to slide him away from the danger. Remember to stay calm and away from your dog’s mouth. He could unintentionally bite you. You need to be safe, too. His tongue will not obstruct his airway nor can he swallow his tongue. When a dog is experiencing a seizure, his body temperature rises. The longer the seizure the higher his temperature can go raising the risk of brain damage. What you can do to help cool his body down is place an ice pack on the nape of his neck. Placing an ice pack on the nape of your dog’s neck during a seizure has been shown to lessen the severity and duration of the seizure. 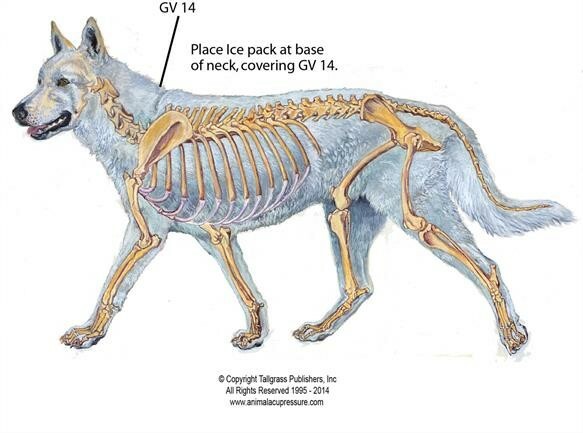 There’s a specific acupressure point at the dorsal base of the dog’s neck called Governing Vessel 14 (GV 14), or Du 14, which is known to clear heat. Use the chart below to see where to place the ice pack.